We will email the layout for approval in 24 hours if you ordered crystal. 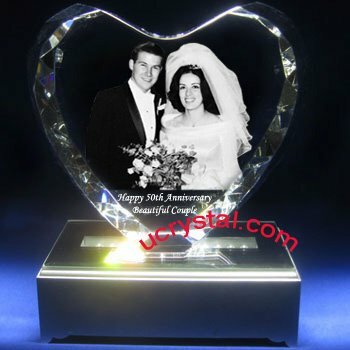 Our 3D extra large diamond crystal heart for 3D personalized photo crystal gift has been very popular as wedding anniversary gifts. It is also widely ordered as a wedding gift, engagement gift, and Valentine’s Day gift. The crystal is carefully polished into a heart shape, and the edges are faceted to add extra elegance. The examples on the left are both personalized with 3D laser crystal engraving. 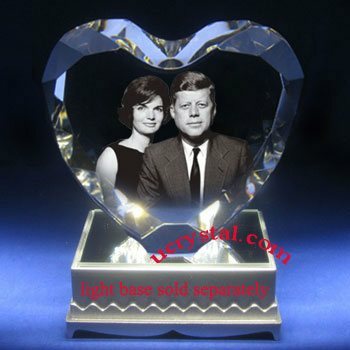 With a single one-dimensional photo, we were able to reproduce the vivid scene from 50 years ago in 3D and use a laser to etch them inside the crystal hearts. Half a century has gone by, but their love has never faded. Does it feel like yesterday? Happy 50th Anniversary! For a 360 degree view of one of the 3D engraved photo crystal heart, please watch the video linked on the home page. 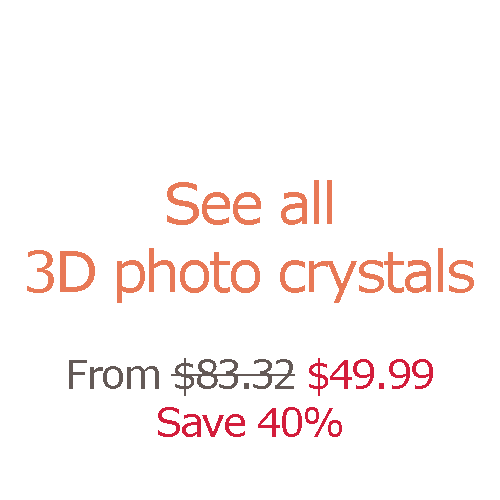 3D diamond photo crystal heart - XL. Size: 6" width x 5" height x 2" thickness. Ideal for 3D (we convert your flat photo into three-dimension with depth) photo engraving with additional cost. Are you planning your engagement or your wedding day? 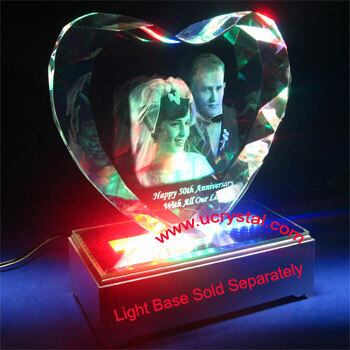 Don't forget to make this 3D diamond photo crystal heart as part of your special moment. It will amaze your love one. This 3D diamond photo crystal heart is polished near perfection. 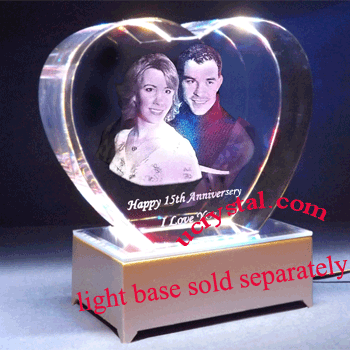 It is especially designed as wedding gift, wedding engagement gift and wedding anniversary gift. 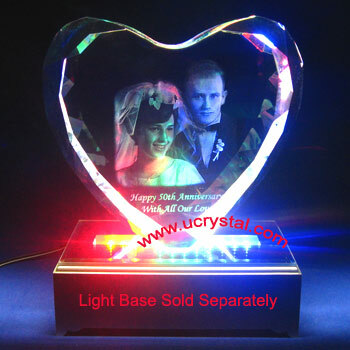 The engraved 3D photo crystal heart is best viewed with a dark background, or on a crystal light base. See section below for suitable light bases. Satin-lined complimentary gift box included. 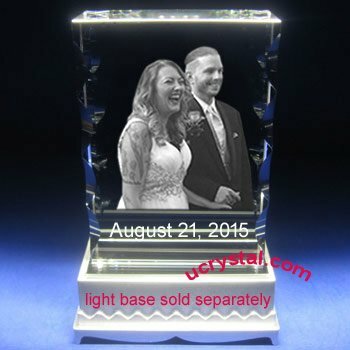 If you order personalized crystal engraving, you can either upload your photo/image during the ordering process, or email (sales@ucrystal.com) it to us after order placement. Text and special instruction can also be entered during the ordering process or through email. It is important that you CHECK YOUR EMAIL frequently since we will send you the layout for your review before we put it into production. After two attempts(in 48 hrs) to contact you through email, we may proceed with the production without your approval. Please choose the photo you like before sending to us. We offer one free layout and can revise it to your satisfactory. However, you will be charged $5 if you decide to change to a different photo after we send you the layout. For 3D engraving, the best photos are front-facing photos (portraits) with minimal headgears. Headshots are busts (chest and up). 1 headshot is one person, and 2 headshots are two people in the same picture. 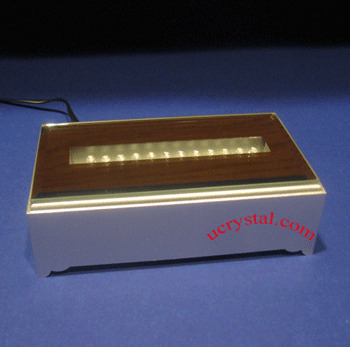 LED light bases are highly recommended for enhancing 2D or 3D photo crystal engraving effects. 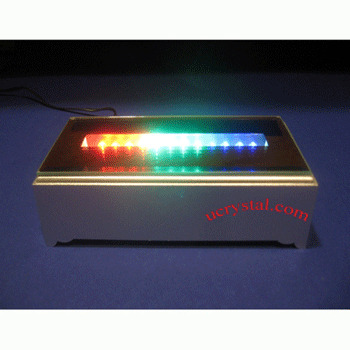 We have light bases either producing steady white lights, or modulating multicolor lights. Some are battery-powered; others have wall adaptors included. Please check their product pages for details. We can pretty much handle all the popular image file formats with such extension as .jpg, .jpeg, .jpe, .tif, .tiff, .bmp, .gif, .pdf, and psd. 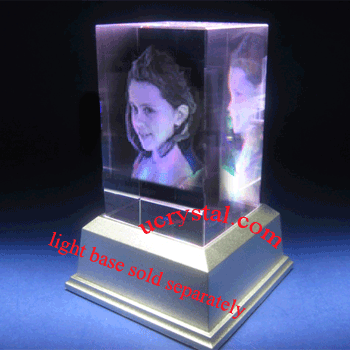 The quality of the personalized photo crystal depends heavily on the original photo quality. 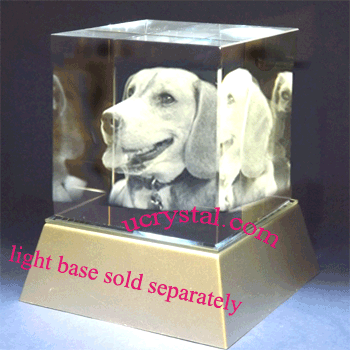 Good photo quality (resolution, contrast) is the first step to ensure the desired results for both 2D and 3D photo crystal engraving. 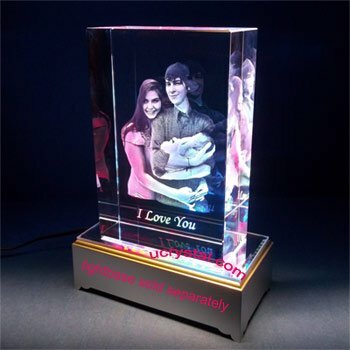 Our standard personalized photo crystal engraving production time is ~3 business days after layout approval. Delivery via USPS Priority Mail takes 2~3 days per USPS. Please allow 1-2 extra days if you order 3D personalized engraving. 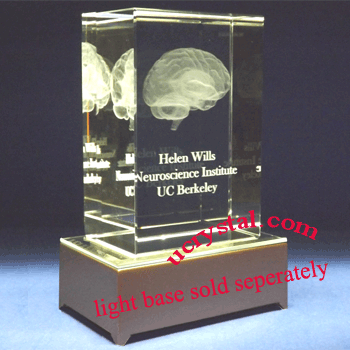 For orders with light bases only, we normally ship them out the next business day. We accept major credit cards (Visa, Mastercard, and AmExp) and PayPal. For international orders, only PayPal is accepted and actual shipping fee will be charged. Please contact us through email for international orders since our online ordering system is for US domestic use only. 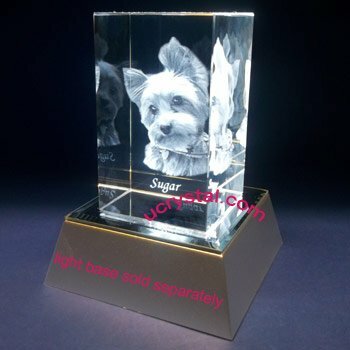 We make every effort to create the finest personalized photo crystal gifts possible. 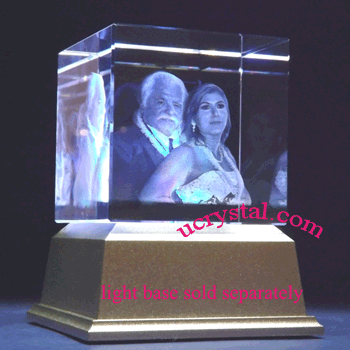 Our personalized 2D or 3D photo crystals are made in and shipped from the United States. For more information, please go to our Frequently Asked Questions page. 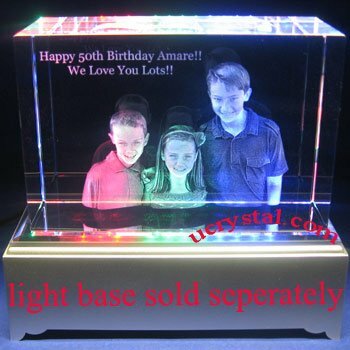 Add Light Base: The visual effects of the engraved laser photo crystals can be improved by using proper crystal light bases or turntables, through which image contrast enhancement can be achieved. 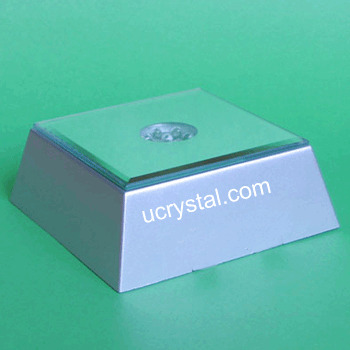 For this piece of laser crystal, the suitable crystal light bases and turntables are as follows. Please go to our facebook for the latest news. ©2009-2019 Rainbow Gifts. All Rights Reserved. Located in San Jose, California, in the heart of the Silicon Valley and the San Francisco Bay Area.